LIFE AS A ROTARIAN.............. is not all about raising money for charitable causes, helping the community, listening to talks on related topics and committee work. Whilst a surprising amount of enjoyment can be obtained by being engaged in these activities, the mix also includes opportunities for socialising and networking where having a good time is the principal motivator. 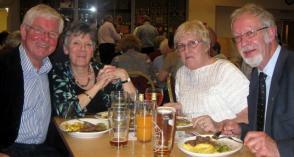 This page of the website records photographs from some of the many social events. The haggis was piped in by 88-year-old Tony Hindley and addressed by Andy Kidd, a member of Pontefract Rotary Club. Master of ceremonies for the evening was Bill Sim. 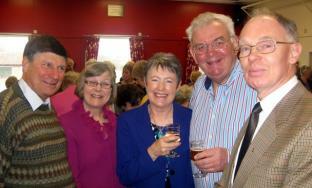 Barbara Clayton sang some traditional Scottish songs with her audience joining in some rousing choruses. All the Caledonian Society members were presented with a gift by club president Michael Townsend, including Norma Redfern who has been instrumental in setting up what has now become an annual event for the club. Both ladies and gentlemen were presented with a buttonhole or corsage of white heather and many of those present wore an item of tartan – including club treasurer Peter Gallivan who was in his trews once again. At the end of the evening everyone joined hands in a circle for Auld Lang Syne. 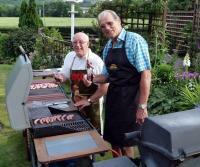 It was fortunate that the club barbecue, returning after an absence of three years, was scheduled for the height of the glorious summer weather. 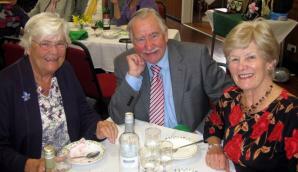 Members and guests enjoyed a delightful evening at the home of Richard and Yvonne Hensby. 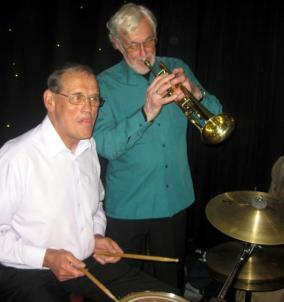 Retired optician Rotarian John Hummerstone is a talented trumpet player who has brought five or six of his friends each year for the last five years to entertain members and their guests at New Brookhouse Club. Here is a selection of photographs taken at the 2013 concert, including one of our president Peter Rhodes drumming for his supper. Hon Rotarian Canon Roger Cressey won the competition for the cake, which was baked by our club treasurer Peter Gallivan and iced by his wife Pauline, who also made the doll. 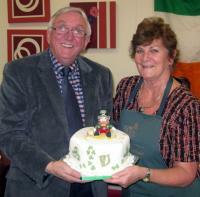 The event at Notton village hall had an Irish theme as it was being held on St Patrick's Day. Roger was presented with his prize by Inner Wheel club president Suzanne Brindley.